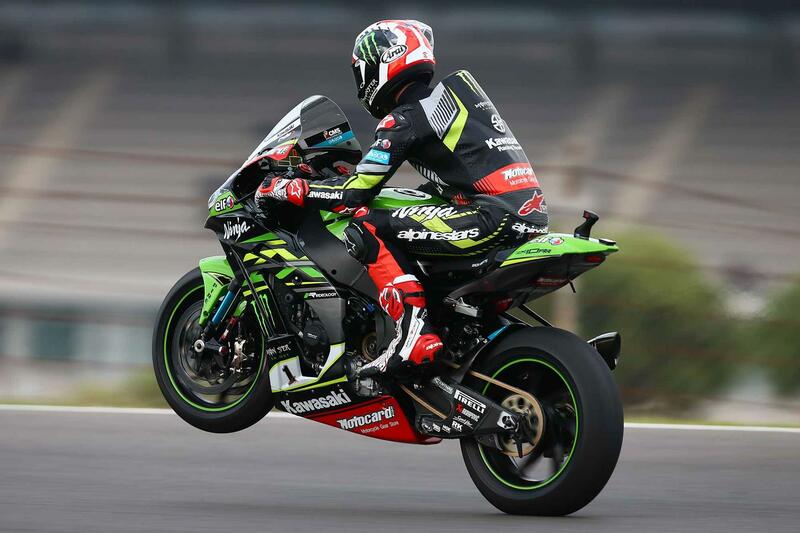 Kawasaki’s Jonathan Rea has taken his second victory of the weekend in Portimao, seeing off a late charge from Pata Yamaha’s Michael van der Mark and the Ducati Panigale R of Marco Melandri. Taking the lead on lap nine from pole man Chaz Davies, the Northern Irish rider came through from ninth the grid, due to the championship’s reverse grid set-up, before slowly edging away from the rest of the field. This left the two Ducatis of Davies and Melandri to battle it out for second place, before both being passed by the Pata Yamaha of van der Mark in one fell swoop in the second half of the race. Still recovering from a breaking his right collarbone in a supermoto accident in late august, Davies eventually dropped behind Melandri for fourth place, 4.594 seconds down on the winning time. Finishing 1.189 seconds ahead of van der Mark, the victory marked Rea’s first triple-double in the class, winning the last six consecutive races and further edging towards World Superbike title number four. Rea’s Kawasaki teammate, Tom Sykes, ended the race in fifth place, dropping down the order from second on the grid. He was then followed by the Milwaukee Aprilia duo of Lorenzo Savadori and Eugene Laverty, who finished sixth and seventh respectively. 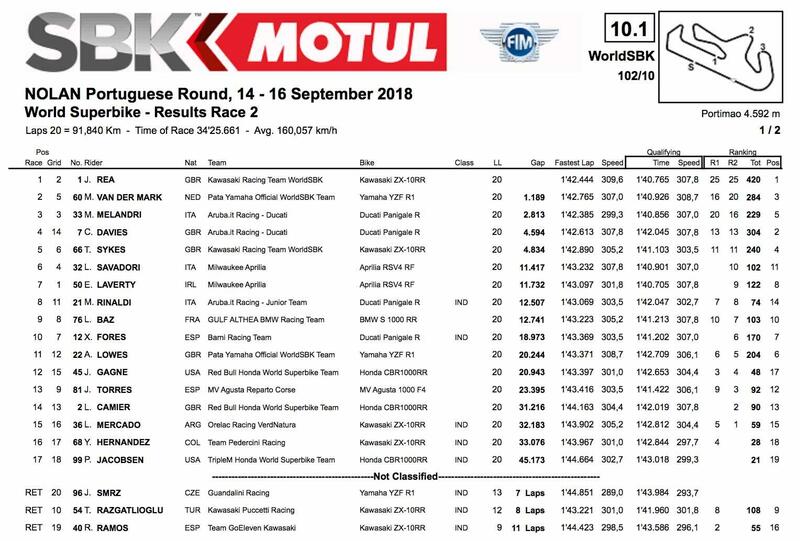 Kawasaki Puccetti Racing's Toprak Razgatlioglu was also running inside the top-10 on his ZX-10RR, before crashing out of contention with just under seven laps remaining. Much like in Saturday’s race, British hopefuls Alex Lowes and Leon Camier struggled to climb the order, with Pata Yamaha’s Lowes finishing in 11th and the Red Bull Honda of Camier coming home in 14th. Other retirements consisted of Jakub Smrz and Roman Ramos.